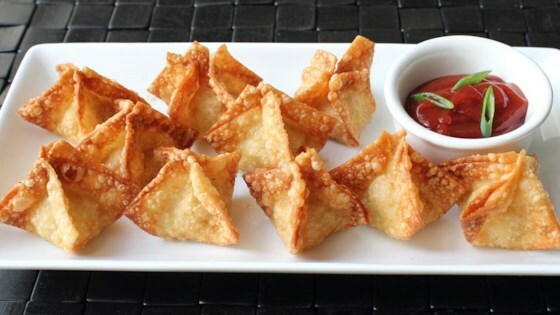 "While not 'authentic,' these crispy crab and cream cheese wontons are one of the most addictive, delicious, and crowd-pleasing appetizers ever created. That is, if the filling has enough crab in it. I'm using a 1 to 1 ratio of crab to cream cheese." Mix cream cheese, crab meat, green onions, garlic, soy sauce, fish sauce, Worcestershire sauce, salt, pepper, sesame oil, and cayenne pepper together with a fork until ingredients are blended thoroughly. Cover with plastic wrap and refrigerate until chilled, 1 or 2 hours. Keep wonton wrappers moist by covering with a damp paper towel. Place a small bowl of water nearby on the work surface. With a wet fingertip, moisten surface of wonton. Place 1 1/2 teaspoons of crab filling in center of wonton. Fold 2 opposite corners toward each other over the filling but without touching tips together yet. Fold up the other 2 corners. Working gently from the bottom, squeeze out any air bubbles; pinch together the 4 seams from the bottom up to create a modified pyramid (or "warhead") shape. Place on a dry surface. Continue with remaining wontons. Heat oil in deep fryer to 350 degrees F. Fry wontons in batches until golden brown and crispy, gently moving them around in the oil with a strainer to brown each surface, about 3 minutes. Let cool about a minute before eating. Serve with the dipping sauce. Whisk ketchup, rice vinegar, brown sugar, and sriracha sauce together in a bowl for the dipping sauce. You can fold these into triangles which is easier, but I prefer the "warhead" fold because you get more crispy goodness with the four crunchy edges. I have made this twice, the second time I left out the fish oil and they were much better. Too fishy with the oil, it over powered the filling. I made these for my husband and he really liked it. He is a chef so it is hard for me to do anything right by him! This recipe makes a lot so I will make again next time I have guests.